The Friends of the Jacobus Vanderveer House Receive County Support to Save Historic Barn ~ The History Girl! A decaying, but architecturally significant, early 19th century Dutch barn from Branchburg, NJ will soon become the centerpiece of a planned farmstead surrounding Bedminster’s historic Jacobus Vanderveer House. In June, The Friends of the Jacobus Vanderveer House were awarded a $94,190 Historic Preservation Grant from the Somerset County Board of Chosen Freeholders for the acquisition and relocation of the 33’ x 51’ barn from a private property on Old York Road to the grounds of the Jacobus Vanderveer House. The existing framing is primarily oak and poplar. Following an endorsement by the Bedminster Township Committee to proceed with the project, The Friends applied for emergency funding from the Somerset County 2016 Historic Preservation Grant Program administered by the Somerset County Cultural and Heritage Commission. The grant application process was led by Leslie Molé, a trustee of The Friends of the Jacobus Vanderveer House who chairs the organization’s Development Committee. The circa 1820-1840 Voorhees Dutch barn (prior to dismantling) on Old York Road in Branchburg. The Friends enlisted the help of HMR Architects, a firm with extensive historic preservation work and expertise, to prepare and submit an application for a Certificate of Eligibility to the New Jersey State Historic Preservation Office (SHPO) for the barn’s listing in the New Jersey and National Historic Registers of Historic Places. The Bedminster Township Historic Preservation Commission unanimously supported that application. The SHPO agreed that the barn had a sufficient number of New World Dutch Barn characteristics that would make it eligible for listing in the New Jersey and National Registers of Historic Places at its proposed relocation site, the Dutch-Colonial Jacobus Vanderveer House in Bedminster. The final day of dismantling. From July through August, historic preservation experts from HMR assisted a team of historic demolition, restoration and relocation experts from Restoration Technologies of New Jersey, LLC, in documenting the barn through photography, annotated measurements and drawings. Boring samples were taken from wood timbers to more closely determine the age of the barn and the local mills that may have crafted its beams and siding. 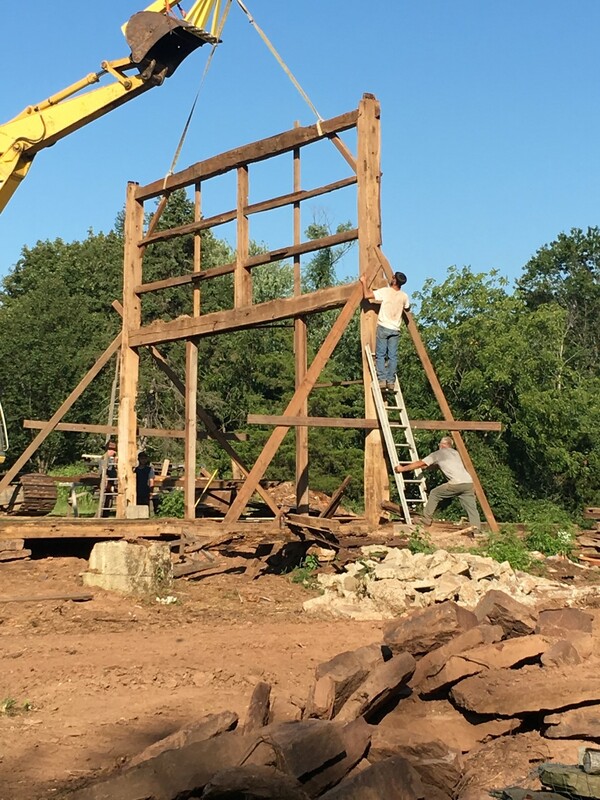 Restoration Technologies then carefully and methodically dismantled the circa 1820-1840 Voorhees Dutch Barn (so-called for a historic owner) in preparation for its repurposed life in Bedminster. The salvaged beams and rafters (primarily composed of oak and poplar), some original hardware, and stone were placed inside a 44-foot trailer and transported to the Vanderveer property where they await reassembly at a future date. “Once it is reassembled and completed, the barn will provide a much-needed year-round space for meetings, community events, and educational programming; exhibitions; and a secure repository for the archaeological artifacts that were excavated during the Pluckemin Archaeology Project. It was one of the most significant Revolutionary War archaeological investigations ever undertaken,” said Mrs. Ray. The steeply pitched gabled roof is visible through the hayloft. While the Somerset County grant will cover the cost of dismantling and relocating the barn, preparation of National and New Jersey Register nomination forms, initial construction documentation and schematic designs, additional funds must be raised to construct a new foundation, reassemble and repair the historic frame and enclose the barn with new siding, stress skin paneling, a roof, windows and doors, as well as complete finishes and building systems. To help finance the next critical phases of the ambitious project, The Friends have initiated a capital campaign aptly named Raising The Bar(N). For more information about the Voorhees Dutch Barn and The Friends’ plans to recreate a late 18th Century/early 19th Century farmstead surrounding the Jacobus Vanderveer House, visit www.jvanderveerhouse.org or call 908-396-6053. The Jacobus Vanderveer House is located at 3055 River Road. The entrance to the house is via River Road Park. For directions and more information about the Jacobus Vanderveer House, visit www.jvanderveerhouse.org.